-- An elegant affair calls for an equally chic clutch. Bag your bag and downsize to one of these beautifully compact designs. Crystal-studded styles catch the candlelight. Shimmering sequins and mesh sparkle on the dance floor. And ruched satin has a silky, sumptuous feel. These marvelous minis are just what that LBD's been missing. The details: Brands include Menbur, Whiting and Davis, Inge Christopher and more. 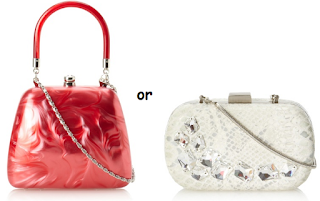 If you love the The Luxe Clutch, did you know you can find them on Ebay?